A large pumice raft was found floating to the west of Minerva Reef in an area about 600 km (372 miles) SE of Fiji and 500 km (310 miles) SW of Tonga, New Zealand's GeoNet reported today. Pumice rafts are created by submarine or near-ocean volcanic activity. The rafts were discovered by an RNZAF flight on Wednesday, November 16, 2016 and later confirmed by GeoNet using satellite imagery acquired by NASA's MODIS on November 15 and 16. They extend for more than 100 km (62 miles). GeoNet added that they are not aware of any active submarine volcanoes in this area. "We have not as yet been able to ‘back track’ the pumice in older images to confirm a source location," GeoNet added. The pumice is generally seen around 179°W and 179°E and 23° 20” S.
In October 2012, a much larger pumice raft was found in the Kermadec Islands north-east of New Zealand and later connected to the eruption of Havre submarine volcano. Although the 2012 pumice was spread over a vast area of the South Pacific, the origin was initially a mystery, just like this one. An undersea volcano several hundred kilometers to the north of the pumice - Monowai - had erupted on August 3, but an airline pilot reported seeing pumice as early as August 1. Two data sources provided clues to pinpoint the volcano: earthquake records and satellite imagery. 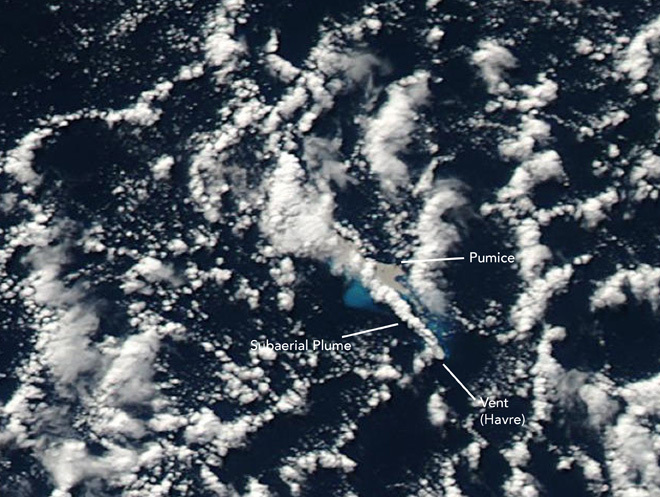 After reports of the pumice rafts surfaced, scientists from Tahiti and New Zealand’s GNS Science connected the eruption with a cluster of earthquakes in the Kermadec Islands on July 17 and 18. Working independently of GNS, volcanologist Erik Klemetti of the Eruptions Blog and NASA visualizer Robert Simmon examined a month’s worth of satellite imagery from NASA’s MODIS. They discovered the first signs of the eruption - ash-stained water, gray pumice, and a volcanic plume - in imagery from 9:50 a.m. and 2:10 p.m. (local time) on July 19, 2012. 2012 pumice rafts generated by the Havre submarine volcano eruption. Image credit: NASA/MODIS. Read more about it here. Although the recent pumice discovery coincides with New Zealand's major M7.8 Kaikoura earthquake of November 13, the connection cannot be confirmed at this time. GNS Science volcanologist Brad Scott said in a recent post that New Zealand's volcanoes are staying quiet. "First off, we’ve had a lot of questions about how the Kaikoura Earthquake has affected our volcanoes. From what we can tell, these systems are separate and the large earthquake(s) haven’t affected our volcanoes," Scott said. For reference, below is his full post published November 16, 2016. We've only made small edits (date where only a day of the week was mentioned) and our usual length and temperature conversions. "Starting offshore North of New Zealand, we work our way south along the Kermadecs, beginning with Monowai submarine volcano, which had a brief bit of activity over the 11-12th November that lasted about 24 hours. This is normal behavior as we see a few days’ of activity every month. Next is Raoul Island, nothing new is apparent there, only the Crater Lakes showing their usual summer warming cycle (climate induced). And it’s a similar situation at White Island. The volcanic tremor levels remain very low and although there have been a couple of earthquakes nearby we see that every other week as well. Auckland is quite too. Moving on-shore, Okataina Volcanic Centre (this includes Tarawera) is quiet, just a couple of small shallow earthquakes near Kawerau and a half dozen to the south in Waikite Valley (a place no stranger to small earthquake swarms). There were also a couple of earthquakes near the Wairakei geothermal system. Taupo Volcanic Centre is quiet, just 2 events so far this week. However, it is a very different story north of Kuratau (near Turangi) which experienced a sequence of earthquakes between the 10th and 13th of November. We had the story ready to run on Monday [November 14], but decided to hold off publishing it because we were focused on the bigger issues of the Kaikoura earthquake. The first, which included the largest earthquakes, started on November 10 and appeared as a typical main-shock after-shock sequence. The largest of the 27 earthquakes in this part was a magnitude 3.3. After a quiescence (aka a geological power nap) of about 21 hours, the second sequence started. It behaved much more like a typical Taupo Volcanic Zone swarm and included 52 earthquakes. The third part of the sequence started about 11 hours after the second and was also swarm like (32 earthquakes). The fourth part included three magnitude 3 earthquakes and an isolated magnitude 3.2 earthquake on the eastern side of the lake (9 events). This part dropped off before midnight Sunday/Monday and so far has not notably reactivated following the M7.5 sequence - i.e. since the first Kaikoura earthquake. The earthquakes range in magnitude from a little less than 1.0 to magnitude 3.3. The earthquakes are located between 5 and 11 km [3.1 and 6.8 miles] deep, with the majority of these between 7 - 8 km [4.3 - 5 miles]. Small shallow earthquakes like these will be well felt by local residents and we have received many felt reports from the area. It is not clear if the sequence has finished yet. Prolonged earthquake swarms (sequences) are a regular feature of the Taupo Volcanic Zone. One near Matata in the mid-2000’s lasted several years. Further south, the Tongariro-Ngauruhoe area is very quiet, just a couple of small earthquakes. The volcanic tremor at Ruapehu is slowly declining, heading back towards normal background levels. The lake temperature is now 31 ˚C [87.8 ˚F], slowly declining from the recent maximum of 39 ˚C [102.2 ˚F]. Mt. Taranaki continues its silent watch over the West Coast of the North Island. So that ends our tour. And thankfully, it looks like the volcanoes have ignored the Kaikoura earthquake(s)." Featured image: Pumice raft as seen by NASA's MODIS - November 2016.